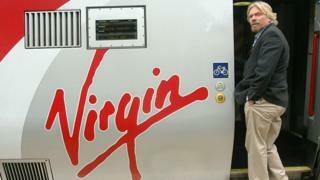 Sir Richard, whose Virgin Trains is 49% owned by Stagecoach, said he was “devastated” by the disqualification. Virgin was bidding to renew the West Coast franchise in partnership with Stagecoach and France’s SNCF. Stagecoach had also put in for the East Midlands and South Eastern franchises, both of which have been rejected. In a blog on Virgin’s corporate website, Sir Richard said Virgin Trains “could be gone from the UK in November”. “We’re baffled why the DfT did not tell us that we would be disqualified or even discuss the issue – they have known about this qualification in our bid on pensions for months,” he wrote. However, the DfT said Stagecoach – had “repeatedly ignored established rules” and that other bidders had met its requirements. The DfT’s statement does not mention Virgin Trains. The DfT also announced that the East Midlands franchise had now been awarded to Abellio “after they presented a strong, compliant bid”. Martin Griffiths, chief executive of Stagecoach, has called for an “urgent meeting” with the DfT. The Pensions Regulator has estimated the UK rail industry needs an additional £5-6bn to plug the pensions shortfall, and the company said it was being asked to take on risks it “cannot control and manage”. Stagecoach shares were down 11.5% by late Wednesday afternoon.